Twenty years ago a truck carrying a homemade bomb ripped apart the Alfred P Murrah federal building in Oklahoma City, in what remains the worst act of home-grown terror on American soil. A paediatric surgeon tells the story of a rushed operation among the ruins, to save a woman's life. Wednesday 19 April 1995 was, like every Wednesday, David Tuggle's main operating day and he was helping a junior registrar through a hernia operation on a small child. During the procedure a nurse came in with the news that a bomb had gone off in downtown Oklahoma City. At first Tuggle wasn't sure how to respond. Disaster training drills were not uncommon in the city - because of the frequency of tornados they were held twice a year, usually on a Wednesday, in April and October. "So I assumed that this was our normal April Wednesday disaster drill and I continued leisurely instructing the student doctor," he says. But then the nurse came in again. "A bomb went off in downtown Oklahoma City, really," she said. "Do you know what you're supposed to do?" The bomb exploded at 09:02 and by 09:30 the first children were being brought in. 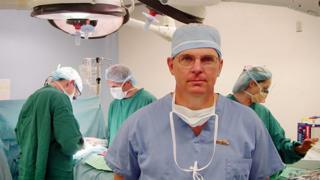 "The first three children that came in needed surgery. One had exposed brain, one had an open leg fracture and one had an injury to a blood vessel in the leg," he says. But Tuggle and the rest of the medical team had no idea of the number of victims to expect. They were hearing reports of injured children at the day care centre in the Murrah Building but no more had arrived at the hospital. At this point Tuggle, along with his friend and colleague Dr Andy Sullivan, asked one of the police officers to take them to the site, to find out what was happening. Tuggle still remembers the scene. "It was really a surreal experience. All of the ceilings were hanging down, we could see bodies that had not been evacuated and they were still bringing bodies out. There was a lot of smoke rising from the building and there were parts of the building that were falling down." Being the middle of Oklahoma City there were plenty of volunteers who were willing to help with the rescue operation. "I saw my dermatologist in scrubs and a gastroenterologist I knew in a three-piece suit walking inside the building without any protection at all," Tuggle says. Tuggle and Sullivan arrived at the Murrah building about 90 minutes after the bombing and by this time most of the survivors had been evacuated. But they were told three people were still trapped inside. On the first floor they found a woman with her right arm and leg under a pile of rubble but there was already a rescue team working through the debris. So they were taken downstairs to the basement where another woman was trapped. Daina Bradley was in a small hole, pinned by a cement support column that had landed on her right leg between the knee and the ankle. "Daina was conscious but she was cold, in a little pool of water, and there were a number of firefighters, rescue workers and paramedics who were down there with us, trying to figure out if there was a way we could lift the cement pillar," says Tuggle. The problem they faced was that the pillar crushing her leg was supporting what remained of the building. A fire fighter was touching the column with his bare hands and if he felt any vibrations had instructions to clear the building. While Tuggle and Sullivan were still discussing how they could free her they were told to clear the building - one of the bomb dogs had got a sniff of explosives on the sixth floor in one of the federal offices. The firefighters almost had to drag them out of the building as they could hear Bradley asking them not to leave. "I told her, 'We have to go, but I'll be back,'" Tuggle says. Sullivan went back to the hospital to get medical instruments and sedatives and after about an hour Tuggle was allowed back into the building. He went down to check on Bradley and then called his colleague. "I had an early version of a cell phone - that big brick made by Motorola," he says. During that discussion they came to the realisation that the only way to save Bradley's life was to amputate her leg. She gave verbal consent so Tuggle administered pain relief through a vein in her neck and applied a tourniquet above her knee, to keep blood loss to a minimum. "Dr Sullivan basically had to crawl in head first and started doing the amputation. He would work for a while and then he'd have to take a break and I'd have to pull him out because he couldn't get out on his own," says Tuggle. "He'd come out and take a sip of water, pant a little bit, and then go back in." The cramped, dark hole, Sullivan had to work in wasn't the only difficulty he faced. The 46cm (18-inch) amputation knife he had brought from the hospital was too long to use in the hole and the disposable scalpels didn't stay sharp for very long and eventually ran out. "So he pulled out his pocket knife and cut the last tendon with that," says Tuggle. The amputation itself took about 10 minutes, but to Tuggle it seemed like forever. With the help of 20 firefighters he managed to pull her out of the hole and clamp the blood vessels to make sure the bleeding had stopped before removing the tourniquet. Getting their patient to the hospital quickly was now the chief concern. Tuggle had asked for an ambulance to be ready and waiting for them at their nearest exit, but when they got to the door it wasn't there. "We were standing there with our cold patient, with no ambulance. I was not happy." So another ambulance had to be found and Tuggle rode with Bradley to the hospital. Daina Bradley had been in the Murrah Building to get a Social Security card for her three-month-old son Gabreon Bruce. She had taken her daughter, Peachlyn Bradley who was three, her sister Felicity Bradley and grandmother Cheryl Hammons. Her two young children and grandmother were all killed in the attack. Her sister was injured but survived. Looking back on that day 20 years later Tuggle is not sure if the city will ever recover. "I think it will have a lasting memory for Oklahoma City," he says, "probably for as long as there's as Oklahoma City." Dr David Tuggle spoke to Witness on the BBC World Service.